Now that so many people ride Bomber Intecs and have experienced the convenience that Intec Titanium riders have had for years ;)... Has anybody used a 20mm quick clip to make a remote binding release for their Intecs (like the Intec pant system??) I sometimes used to find it a little difficult to grab the Intec release handle through my pants so the remote binding release was quite an improvement. If anybody's interested I can post a couple of pictures. I'll post some pictures tomorrow morning. I' in the car at the moment, on my way to the slopes. just a thought... have you ever had an unwanted (no, not premature!!! heheheh) release due to pant cuff rising when bending at the knee? Cover your eyes, here are my pants! I have full side-zip pants, so I had a length of nylon strap sewen into each leg. On the nylon straps I put 20mm quick clips which clip straight into the binding release handles (the handles are actually designed for this.) It's easy to adjust the length of the nylon strap so that to release the bindings I just pull the side of my trousers - Works perfectly. 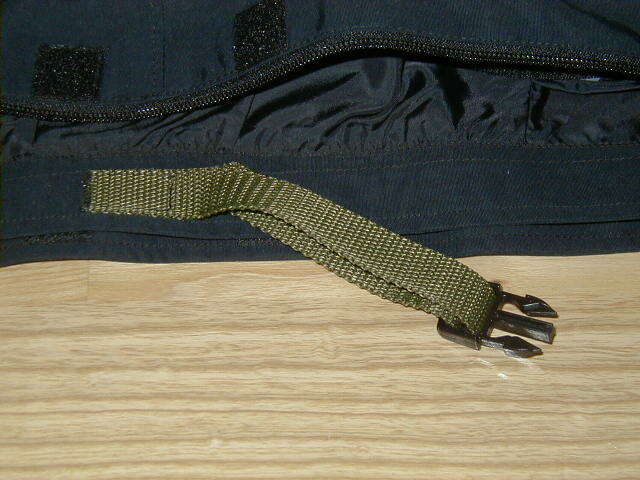 There's a picture of the nylon strap and the 20mm clip in the inside on one of my trouser legs. 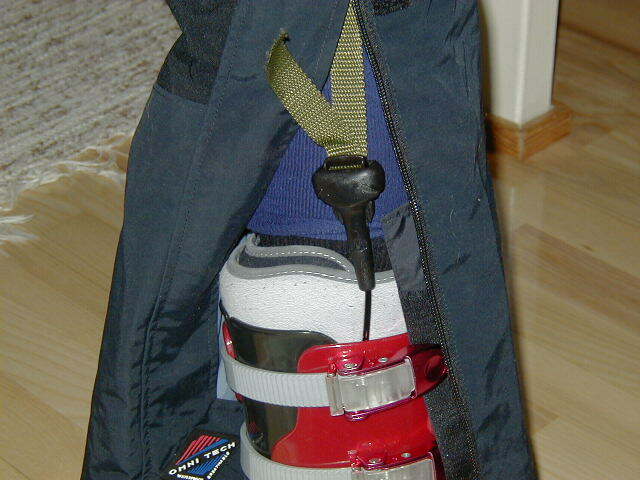 The other picture is me wearing the trousers with the side-zip open to show the quick clip cliped into the binding release handle. If you go to buy some quick clips it's best to take the binding release handle with you just so you can check that you but the right sort. Did you have to cut a hole in the pants to have it go through? I didn't make any holes in the trousers - The nylon strap was sewn to the inside on the trouser leg and I have to pull the actual trouser leg to release the binding. Look at the 'CLIP.JPG' attachment in my previous post and you'll see. Got it. took a second look and I understand how that was done. Can you do that with a regular needle and thread or do you need an industrial sewing machine? Subject: Regular machine'll do it easy. Just use nylon upholstry thread and, a #18 needle. I've sewn tons of webbing and it works fine. Just go slow.